As the T was designed to be able to be completely disassembled (see this post), Rockwell should be able to send you a replacement 1-piece once they have them and once you've disassembled yours, it should just drop right in. The ability to self service was a great design decision! Once they have one sounds like their E-mails! One can hope and I hope to hear from Rockwell but So far I have not. Not from their web site, not from E-mail, not from anywhere. I do believe I could assemble the razor with a one piece T-bar assuming it fits and works properly? But, will it? So far I think the design is simply flawed! SO long a wait and so little produced! I thought the shave for 4 days was great. a disposable razor could do the same? And for a lot less wait and a lot less money!!! Not to pleased with the long wait for a reply from Rockwell either! Kickstarter beware, I say!!! Wow, that is truly shocking to hear. 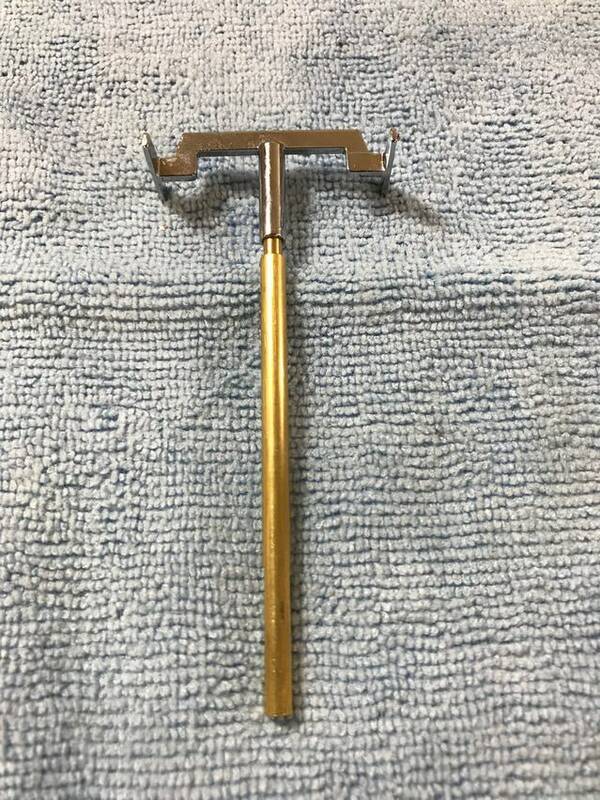 As I posted earlier, I got my Model T this week and I did inquire with Rockwell as to whether this razor included the "new" parts described in their last update. The response I got was a little cagey, saying that the T-bar was one that passed specs and is therefore "the same" as the newer parts. But it's not the the newer T-bar, so I suspect that my razor has the same parts as yours. I'll be holding my breath. And just because it's KS, that doesn't give license to pass off a clearly flawed product as a pledge reward. Rockwell should absolutely make this right. Couldn't figure out how to post pictures. It says File too large. Tried several ways and file still too large. Pictures would only show door assembly not connected to razor. I can clearly see the post or T-bar in the handle shaft of the razor. The door assembly is not connected any longer. It simply fell apart. Like I said the glue or the crimp or whatever held the 2 pieces together failed. I feel for you, as I have the exact same problem when I try to upload pictures here. Please keep us posted about the Rockwell answer. Either the picture has to be cropped, or download Tapatalk and it will post any size pictures. Jimjo1031 helped me with the picture cropping idea. Here is a picture of the 2 parts now separated. You can just see the post in the razor body. Still have not heard anything from Rockwell as to how to proceed? stuartganis and Kypros Christodoulides like this. Did you send this picture to Rockwell? Perhaps you should post it on the KS forum? I was getting ready for some pictures when a couple of mornings ago the Rockwell Model T fell apart. I think what happened is the door assembly in the razor I got has/had? the crimped or glued? 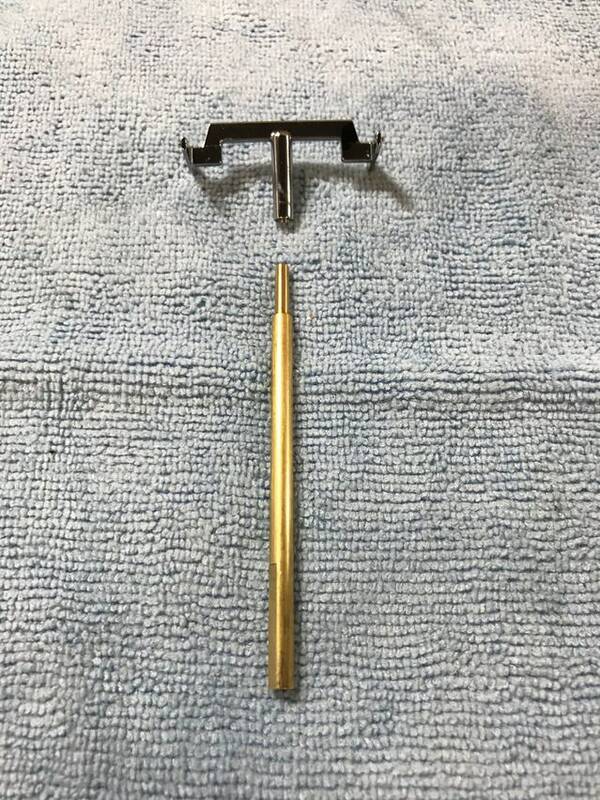 T-bar assembly and it simply pulled apart when tightening the razor blade to shave with. I don't think the 2 piece T-bar assembly would hold up for anyone. And, now my razor is not useable. Not sure what to do as I e-mailed Rockwell and have not heard anything from them as to a solution for fixing the razor or sending it back to them for repairs. And, I am not so sure there is a solution and that the razor can be fixed? Especially if there is no way to get rid of the 2 piece T-bar/doors assembly. IMHO this may be a serious design flaw? So, no pictures necessary at this point. The razor lasted a week for me with gentile use. Am I disappointed? You betcha!! But, that's Kickstarter for you! No guarantees! They are now currently making (or working on) a 1 piece T bar assembly. In the last update they mentioned it. Just to check, did you send an email to info@RockwellRazors.com? Please note the S on the Razors, some people leave it off and Rockwell does not get those emails. I am not sure if they are flooded with emails (likely) or if they did not get yours, but they will replace your razor. You will not be stuck with a pile of parts, but it may take time for a replacement. How long has it been since you initially tried to email them? From your pictures I would guess the parts were slightly off which resulted in the friction fit between the 2 pieces not being as good as it should be. I received a reply from Rockwell and they assured me they will send me a replacement razor ASAP and they won't fix my current razor. They also said that they will test the replacement to make sure there will be no problems with the replacement. Sounds good to me! I hope the replacement razor shaves as good as the current razor I shaved with for only a few days before the T-bar came apart? Should be a winner when the T-bar troubles stop? The finish on the razor is very nice and as I first said it opened and closed with extreme smoothness. The seam on the doors when closed was/is very tight and hard to see. I don't foresee any future problems-----Sans the T-bar issue of course. When I receive the replacement razor I will try and post my impressions here. AverageJoe and PLANofMAN like this. Averagejoe, I agree with your opinions. I E-mailed 2 days ago and posted on their web site with a chat entry. They did get back to me and they are replacing the razor. So far--still--so good! I have many razors. Far too many really and for the few days I shaved with the Model T I liked the shave and the razor as good or better than all my others. I could see it becoming my one razor for every days shaves until shaving boredom settles back in! Rockwell told me they didn't want to repair my current razor. I would think it would be possible as I only shaved with the razor for less than a week and there is no damage to the finish or any other parts on my current T-bar separated razor? Btu, replacement works for me especially when they assured me they would test the heck out of it to assure no future difficulties. Good customer support for sure-----so far! Just curious... are they making you return the broken one? They did not say? Not sure and the replacement time frame was not specific. Just told me I would be first on the list with a tested replacement? I'm surprised they are not using red locktite on the two piece bars. I'm a bit surprised it worked as well as it did. If I'm understanding the design, they are basically using the friction between the two pieces of the rod to counter the spring tension of the blade. (Does a model T have a final quarter turn like a Gillette? If so, there is even more tension.) One could almost imagine a scenario where the entire door assembly launches itself off the razor. First, I know nothing about the properties of various metals, but it seems like you and @PLANofMAN do, so I have some questions for you. My understanding is the new Rockwell one-piece T-bar is made entirely of ZAMAC. Isn't ZAMAC a fairly brittle metal? Isn't the T-Bar assembly under stress, from pressure and perhaps torque? Finally, if the first two questions are true, is ZAMAC the best metal for a on-piece T-Bar? We don't know if the bar is made from Zamac specifically. Zamac 3 is just one of the most common zinc alloys. Many of us are old enough to remember the die cast cap guns of our youth. The first part that broke was almost always the hammer, due to the shock, of well, always being hammered on. In this application, the t-bar is more like the trigger, though much more robust. I'm less concerned about whether the zinc is strong enough for the part than I am about the fact that it moves. Zinc holds up very well...until the plating is compromised. I'm concerned that there appear to be lots of spots where it can rub against other parts. Like everything else to do with this razor, I'm adopting a wait and see attitude. Merkur's vision 2000 relied on a piece of Teflon tape for tension/friction, so I don't see how the Model T could be any worse. As for your second question, "Is Zamac the best metal for a one-piece t-bar?" No!!! Even hell no! But from a manufacturer's viewpoint it's ideal. It's strong, cheap, and easy to work with, but from a consumer's viewpoint, almost any other metal would be a better choice, with the exception of aluminum and carbon steel. But they would have to be machined, rather than cast. DesertTime, Frijolero and stuartganis like this. Your razor fell apart too? No but something is wrong. Second shave in, one side is more aggressive than the other. “That sounds highly unusual and, as you mentioned, is clearly not up to our team's quality control standards. It appears there may have been a defect in the unit you received that slipped past our quality control team. I will work on getting a replacement shipped to you in the very next round of fulfillment (your replacement will be next up on the list of shipments). In the meantime, if the blade alignment issue is visible to the naked eye, any photos you could provide of the discrepancy for our engineers would be tremendously helpful.